Cetyl Myristoleate (CMO) supplements can be found in several forms from various suppliers. However, Myristin® softgels from EHP Products stand apart. 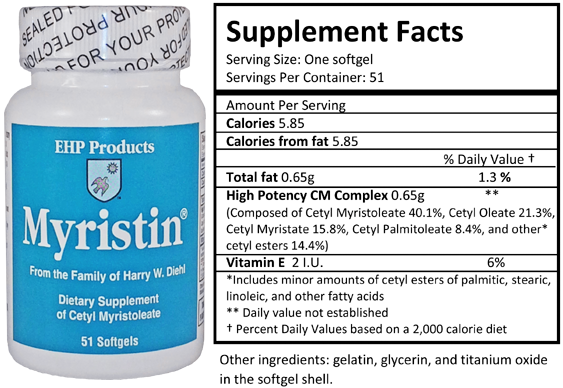 Myristin® softgels contain a cetylated fatty acids oil offering a 40% concentration of CMO. This 40% strength is the highest of any CMO product in the world. In comparison to other CMO supplements on the market, the large composition of cetyl myristoleate per Myristin® softgel (260 mg) allows consumers to take fewer doses daily and to take in the recommended amount in a shorter period of time. Myristin® is made exclusively in the USA and is gluten-free, non-GMO, and non-allergenic. As the family company of Harry W. Diehl, the discoverer of Cetyl Myristoleate, EHP Products is determined to offer the highest quality CMO products at exceptional pricing. The molecular CMO in our Myristin® softgels is priced at $2.50 per gram*. We encourage customers to compare any competing product's price and volume of molecular CMO to Myristin®’s. Our product adheres to FDA labeling regulations, which require that we report exact amounts of cetylated fatty acids (650 mg) and cetyl myristoleate (260 mg) in a serving size of one softgel. If the label of a competitive CMO product does not comply with FDA label regulations, it is difficult, if not impossible, to determine the amount of molecular CMO in their product. For customers who have trouble tolerating oil products such as fish oil, EHP Products offers Myristin® capsules which contain 110 mg CMO per capsule. On a corn starch base, this powder version of Myristin® is better tolerated by customers with sensitive stomachs. 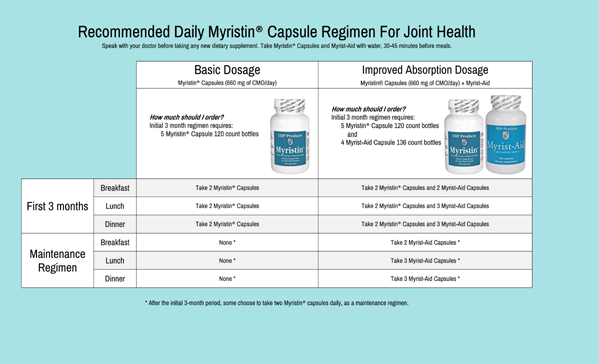 To order Myristin® in capsule form, look for Myristin® capsules (120 count) in our online store. 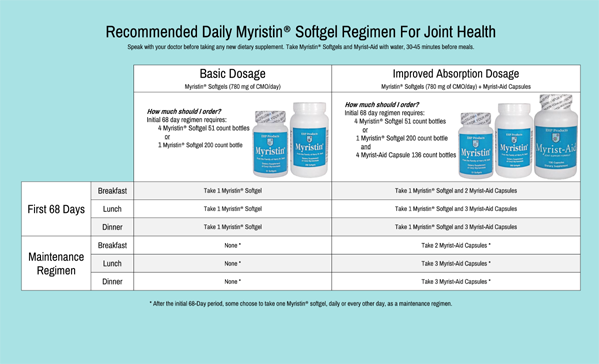 Those looking for improved absorption should consider taking EHP Products’ Myrist-Aid capsules along with Myristin®. For an alternative to Myrist-Aid, EHP Products’ Milk Thistle Extract may also aid in the absorption of Myristin®. *Based on 52 grams of molecular CMO in one bottle of Myristin® Softgels 200 count at $129.95 per bottle. This is the discounted price when purchased in a quantity of four bottles.